Do you consider yourself bohemian? 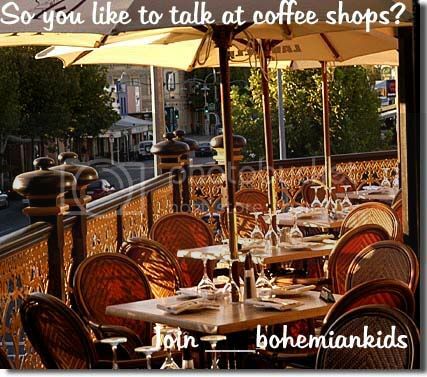 ___bohemiankids is a rating community, looking for the coolest people out there. We are a rating community...this is a place for people with a common interest in music/literature/films/coffee/etc. to meet and talk and such. We won't discriminate against anyone for looks, but we will based on personality. You will be banned if you start any drama. ♣ You must fill out an application to join! ♣ You may not vote: "either way" on an application, however you may vote "sway me" instead of that - because then the person you were voting on may elaborate on something to aid you in making a decision. ♣ YOU ARE NOT ALLOWED TO COMMENT ON OTHER ENTRIES AND/OR MAKE ANY OTHER POSTS UNTIL YOU HAVE BEEN ACCEPTED INTO THE COMMUNITY. ♣ This is a rating community, so don't complain if not everyone likes you. Again, this community is based on personality. If you want a community based on looks, I'm sure there are others for that but this is not one of them. In your application you don't have to post pictures of YOURSELF, but they are to represent you. ♣ please no adverstising, any promotion of other communities may be posted if the mods feel that they relate to the nature of the community and are behind an lj-cut. <img src="http://img.photobucket.com/albums/v678/bellemaitresse/livejournal%20banners/bohemian.jpg" alt="Image hosted by Photobucket.com"> Join <lj user="___bohemiankids">!